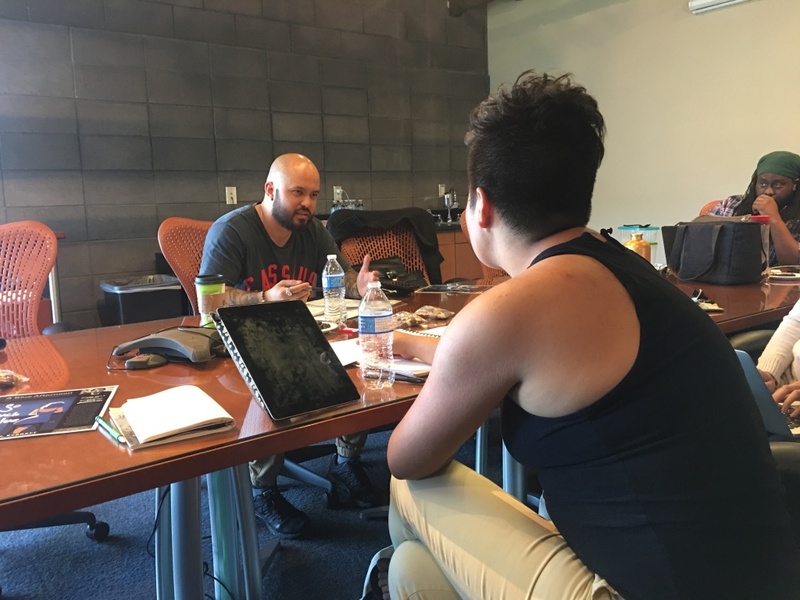 UC San Diego MFA candidates work with veterans in the playwriting workshop. Kendrick Dial isn’t what you might picture when you think of a military veteran. He has long dreadlocks and a relaxed way about him. We talked sitting in the La Jolla Playhouse library, in the San Diego suburb of the same name. Dial was there as a student in the Veterans’ Playwriting Workshop. People used to look at me and they wouldn't know that I was in the military because I didn't carry myself like that. And when they meet me now, they're kind of actually shocked to even believe that I was ever in the military. My nature is, you know, go with the flow. Dial was in the Navy, first as a radar technician and then as a substance abuse counselor. He wants to stress something about veterans: Do not stereotype us. I think it gives us a starting point to bond ... Kendrick is also a former Navy. We have that in common and that gives us a frame of reference from which we can then begin to relate to each other. Coming to see him as a writer and appreciate his work gives me an even deeper level of appreciation for him as a human being, and I think it helps us to find commonality and intersectionality. Jamey Keeton (left) works with MFA candidate Lily Padilla. Students explore different types of playwriting, from dramatic monologues to one-person shows. They don’t have to write about their military experience, but it does come up in different ways. Jamey Keeton, a former Marine, described several play ideas that weren’t about his personal life, but had military themes. One is about “an Atlantian military scout [who] is caught and interrogated by the CIA, [seeking] to learn about the location of Atlantis, a technologically advanced civilization with abundant resources.” And another revisits Uncle Sam each year on the Fourth of July. The other veterans had a lot to say about Keeton’s ideas. Veteran and playwright Maurice DeCaul started this workshop – and several other veterans' theater pilot programs around the country – with the help of a grant from Theater Communications Group — a support organization for theaters around the country. “Building the space that allows for people to meet and become friends and trust each other is important,” he said. DeCaul returned from Iraq hoping to use his GI bill scholarship to study history and become a lawyer. 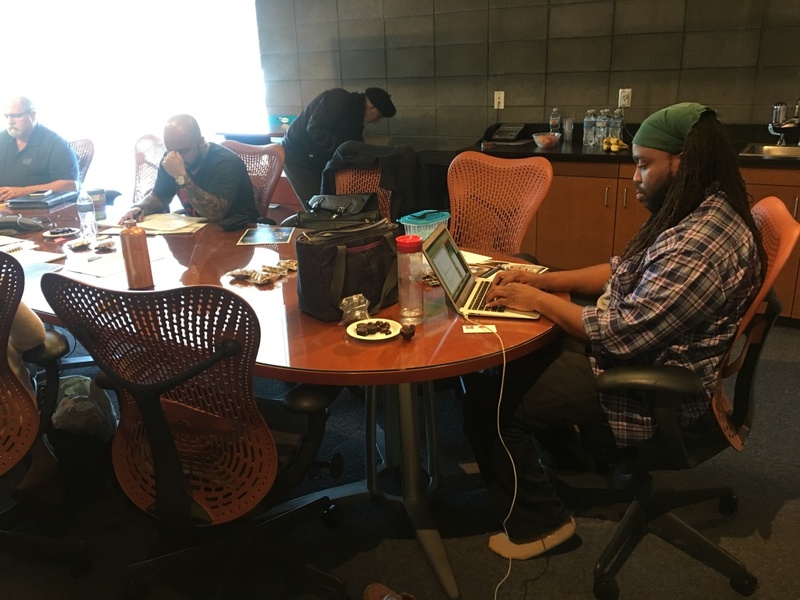 But as he was waiting to apply for college, he came upon a writing workshop for veterans. It wasn’t part of his plan. It was the first time I was writing about the war. And it was the first time that I had talked about it or wrote about it since I had come back — and I had come back six years prior. DeCaul dropped his plans to become a lawyer. Instead he earned degrees in creative writing from Columbia and New York University, and now splits his time between NYU and Brown University, where he is an artist-in-residence. Left to right Kurt Kalbfleisch, Jamey Keeton, Anthony Lobue and Kendrick Dial. Back at the La Jolla workshop, other veterans are also expanding their horizons. Veteran Armando De la Torre is a visual artist who came to the workshop to expand his work into theater. I use the art to work through my traumas that I experienced during the military. Through art I got some tools to be able to work in society. Through that, I felt like I worked through my own issues of depression or lack of connection to how society works — all sorts of problems that occur when you're part of a militarized organization. De la Torre was skeptical at first when he came to the workshop. In general, I've seen some organizations that are not really addressing veterans’ needs because very few people really know what veterans need. 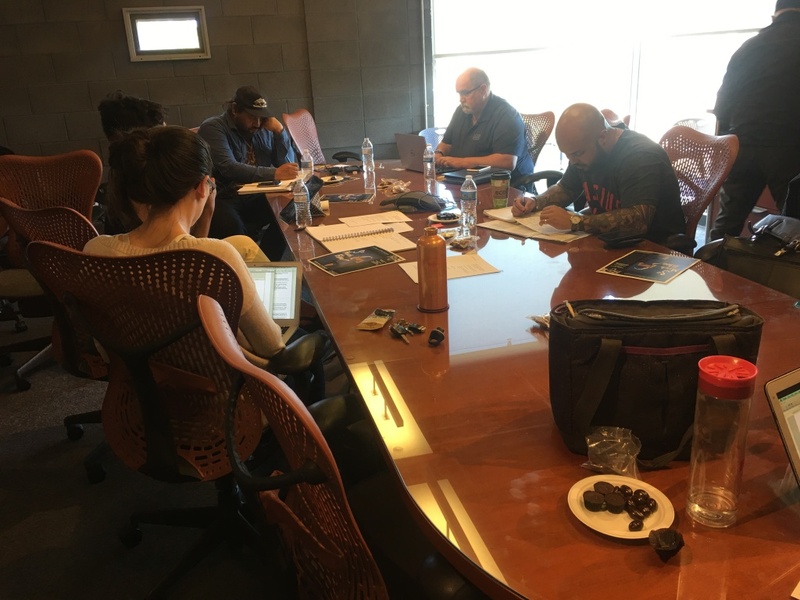 It turns out, at least for these veterans, they needed a chance to write some plays and bond in a theater overlooking the Pacific Ocean.